We are coming into winter here in Australia so I created these thick puff stitch hats to keep my kiddy’s heads warm during the cooler months ahead. As with all of my patterns, feel free to sell the finished product if you wish. Yarn over, insert hook in designated stitch. Yarn over and pull through (three loops on hook). Pull loops upward, the same height as a double crochet stitch. Repeat three more times. Yarn over and pull through all loops on hook. Chain one to finish. ROW 3: Ch 1. Puff st in same st (last SC from pervious row). *Ch 1. Skip 1 st and SC in next st (top of puff st from pervious row). Ch 1. Skip 1 st and puff st in next st.* Repeat to end of row. Turn. ROW 4: Ch 1. 1 SC in same st. *Ch 1. Skip 1 st and puff st in next st (SC from previous row). Ch 1. Skip next st and SC in next st (top of puff st from previous row). * Repeat to end of row. Turn. ROWS 5 – 17: Repeat rows 3 and 4. Fold the panel in half and slip stitch the sides together. Cast off and weave in ends. Join yarn to one of the front corners and HDC 34 evenly across the bottom (from corner t corner). Chain 2 and turn. *HDC in next 4 sts then DC 2 together* Repeat to end. Chain 40 for the tie. Cast off. Attach yarn to the opposite corner and chain 40 again for the other tie. I left a long tail to tie the pompoms to. ROWS 5 – 14: Repeat rows 3 and 4. Join yarn to one of the front corners and HDC 30 evenly across the bottom from corner to corner (I put two HDCs in the first row one HDC in every other row). Chain 2 and turn. *HDC in next 4 sts then DC 2 together* Repeat to end. Chain 30 for the tie. Cast off. Attach yarn to the opposite corner and chain 30 again for the other tie. I left a long tail to tie the pompoms to. This is awesome! A friend of mine just had a baby and this will be the perfect gift! this is a beautiful pattern, cant wait to give it a try! I wonder how silly I would look in one these…? So darn cute! No kiddies in this house so I will just have to make one for myself. 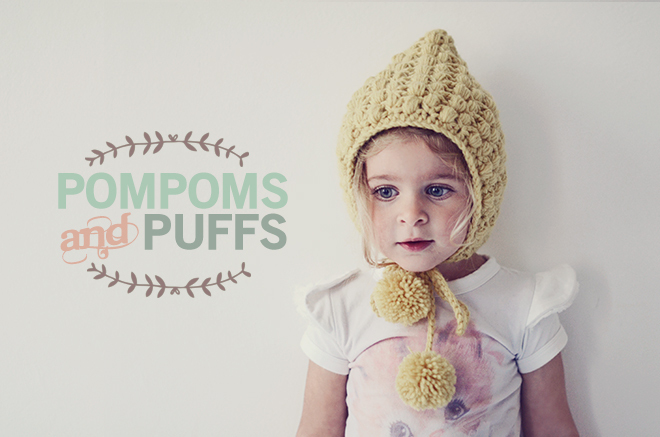 I´m all in for some pompoms and puffs. Thanks a million for the pattern. So cute! 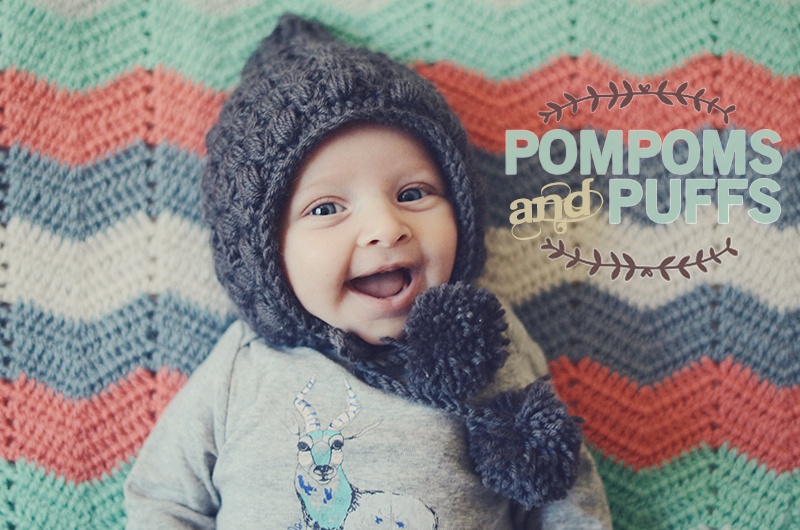 Do you have instructions on how to make the pompoms? I used a Clover Pom-Pom Maker but they are pretty easy to make with just some cardboard. I will see it I can find a good tutorial. What a fabulous free pattern 🙂 The photography is beautiful (and so are the models!). Thank you! I can take credit for the photography but (unfortunately) not for the models – they are all my husbands side of the family. I was hoping the second one would have a teensy bit of me in him. But no. gorgeous pattern! Wondering if you would share the name of the ‘font’ for the beautiful little “frame” of leaves & heart….simply beautiful! Just adorable! Thanks so much for the pattern! I am LOVING this! I have no idea how to crochet but I saw this on pintrest and now I am determined to teach myself so I can make this for my cuties! Gorgeous gorgeous gorgeous! I love this hat! Thank you for sharing the pattern. I would like to are this for my grand daughter, but need a size 9-12 months. Can you give me an. Idea of how to modify the pattern? Also, please don’t worry about the children looking like your husband’s side of the family- they are adorable- we found that the older mine got, the more they resembled me!! Multiples of four, with the starting row around the face, got it! Thanks so much 🙂 So excited to try it! I love this pattern so much! Thank you for posting it 🙂 I need to make this in a child size for my daughter. I see that you added 8 chains from infant to toddler. Maybe I should add 8 to the toddler size? I am having trouble visualizing where the starting row ends up after you put it all together. Is it going to be all around the face? is that where I should measure? Any tips would be so helpful! Thank you! Fabulous pattern, thanks so much for sharing! Would love to see you at my weekly linky party Craft Schooling Sunday! Hello, beautiful hat, I am going to try it out! Are your patterns done in the British or American system? Thanks! I have a question about this cute hat. The puff stitch has a chain after it to finish it off. In the pattern, it says to puff stitch then ch 1. Is this an extra chain in addition to the one under instructions for the puff stitch? I’m on row 3, and when I’m skipping a stitch, there is an extra stich in there. I put the extra ch, so really I have two ch after the puff. It’s not looking right! Help! Thanks. Yep, that’s it. 2 chains after the puff. Love this hat but I have a question… I know that row 2 should have 11 puff stitches. Should all the rows after that also have 11? For some reason mine have 12. Thanks!! Yes, they should all have 11. Sorry for the late reply. I think she was about three here BUT she has a tiny head. TINY. So it should be fine for an 18 month old.